To get a sense of how the first generation Tamron 150-600 measures up, read our shoot out between it, the Sigma 150-600, and the Nikon 200-500. 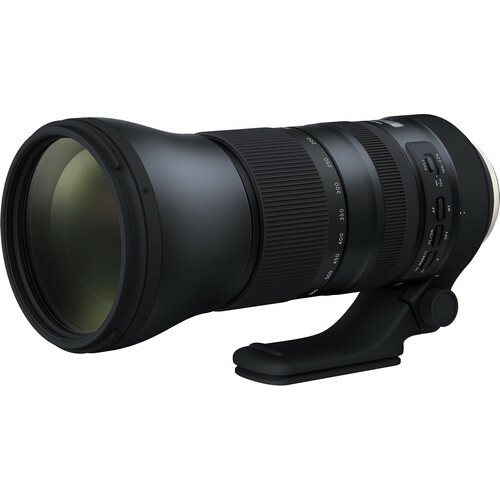 Spanning a versatile and long-reaching focal length range, the Nikon F-mount SP 150-600mm f/5-6.3 Di VC USD G2 from Tamron is a 4x zoom covering telephoto to super telephoto perspectives. Complementing the long reach is an optimized optical design that features three low dispersion (LD) glass elements to reduce chromatic aberrations and color fringing throughout the zoom range. eBAND and BBAR coatings have also been applied to reduce ghosting and flare when working in strong, backlit lighting conditions. Spanning a versatile, long-reaching range, this tele to super-tele zoom is designed for FX-format Nikon F-mount cameras, and can also be used with DX models where it will provide a 225-900mm equivalent focal length range. A FLEX ZOOM LOCK mechanism enables you to lock the zoom at any position in order to prevent unwanted zoom extension during use. A conventional zoom lock switch is also featured, which locks the zoom in place at the 150mm position to prevent zoom extension during transportation. Durable metal barrel uses a curved, ergonomic shape for easy handling, and both the zoom and focus rings are textured for improved grip. A removable rotating tripod collar features an Arca-type compatible foot and benefits working with the lens atop a tripod or monopod. An electromagnetic diaphragm is used for more precise and consistent exposure control, especially when shooting at high continuous shooting rates. Due to this unique design, this lens is only compatible with select Nikon F-mount cameras that support an electromagnetic diaphragm, including the D3100, D3200, D3300, D5000, D5100, D5200, D5300, D5500, D7000, D7100, D7200, D300, D300s, D600, D610, D700, D750, D800, D800E, D810, D810A, D3x, D3s, D4, D4s, Df, D500, and D5 DSLRs.